Attention please! Special New Feature Coming Tomorrow! If you’re an Artsy Forager fan on Facebook & Twitter, you may have seen my little hint regarding a new feature coming to the Artsy Forager Facebook page. ( If you’re not following AF on Facebook and/or Twitter, it’s so easy! Handy little buttons in the right sidebar will take you right to the pages! ) Facebook fans know that the powers that be at FB have rolled out a new look for profiles and pages. Always one to look on the brighter side of things, when I changed the AF page over, I started thinking about how I could use the new format to further promote the artists’ work I love..
Annoucing the new Artsy Forager Facebook Featured Artist program! Ok, I'm obviously not a graphic designer..
Each month a new artist’s work will be featured as the Artsy Forager Facebook page cover image, there will also be a special feature post devoted to that artist on the blog, a thumbnail of their work on the Artsy Forager sidebar, as well as fun tidbits featuring their work on Facebook & Twitter throughout their month! Are you excited?! The inaugural artist will go up TOMORROW, April 1st, so stay tuned tomorrow for the big reveal! PS– Due to an overwhelmingly positive response from the artists I contacted, Facebook Featured Artist spots are filled as of right now through November 2013. (!) First priority was given to artists with whom I have an ongoing correspondence or relationship. If you’re an artist who has been featured on Artsy Forager and would like to be a Facebook Featured Artist after November 2013, feel free to shoot me an email. Thanks! Artsy Forager reader Kim Carney creates these fantastic folk art sculptures, Brantlers, using recycled wood, branches and various found objects. Such a fun take on “trophies”! Check them all out on Kim’s website and let me know in the comments which one is your fave! I’m partial this guy. 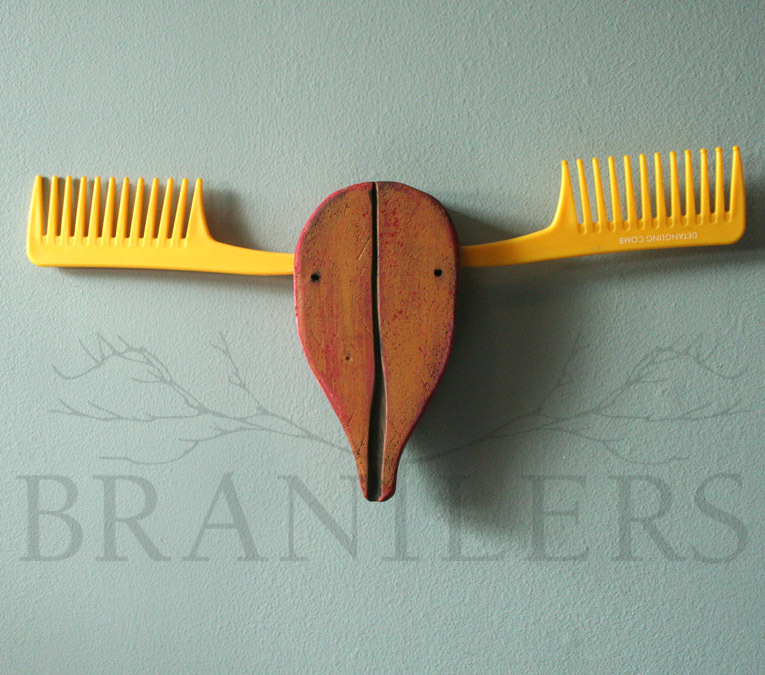 Featured image is Painted Brushes Brantler. All images are via the artist’s website. Hubby and I have been going through major winter cabin fever. Every weekend lately, it’s been either snowing or raining. We miss getting our hiking on and are ready to see some wildlife actually in the wild ( the diaorama at the local Cabellas doesn’t count ). There’s just something so magical about coming across creatures in the woods. Are you experiencing the itch to get outdoors and do some animal watching? Maybe these will help.. Featured image is by Corine Perier. All images are via the artists’ websites, linked above. Does this sculpture by New York artist Tom Fruin remind you of anyone? I’ll give you a hint..
Do you see it? Love how these very different works compliment each other! Read more about Karen Schepf’s work here and Tom Fruin’s workhereand on Design Boom. Featured images is Light & Shadow Play, Kolonihavehus, photographed by Nuno Neto. Images are via the artists’ websites unless otherwise noted. Being a hyper visual person, I remember imagery like nobody’s business. Names, however, often escape me. So I was very excited when on Pinterest last week, I spotted the Omaha artist Karen Schnepf. We’d carried a few of her paintings while I was working in a gallery, purchased through an art rep, so we’d never had any contact with her personally. I was so delighted to find her again so that I could share her striking, color saturated work with you! Let me just say that none of these photos do Karen’s work justice. Her canvases are super high-gloss, making it nearly impossible to get accurate photos. But that deep shine is one of the things that I love about her work. The glossy surface enhances the brilliance of her saturated color palette. Her use of such vibrant color tempered with black and lustrous surfaces call to mind modern stained glass on canvas. The color seems to virtually ooze across the canvas. I want to swim in it! 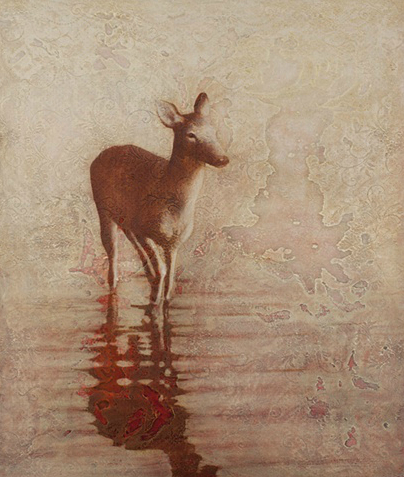 To see more of Karen Schnepf’s work, please visit her website. Featured image is Painting-033. All images are via the artist’s website. Anyone who knows me is aware of my love affair with scarves. As in I own way too many and am powerless to resist their call. I even hike wearing a scarf ( ok, a bandana, really ). They instantly up the degree of artsiness in any outfit. 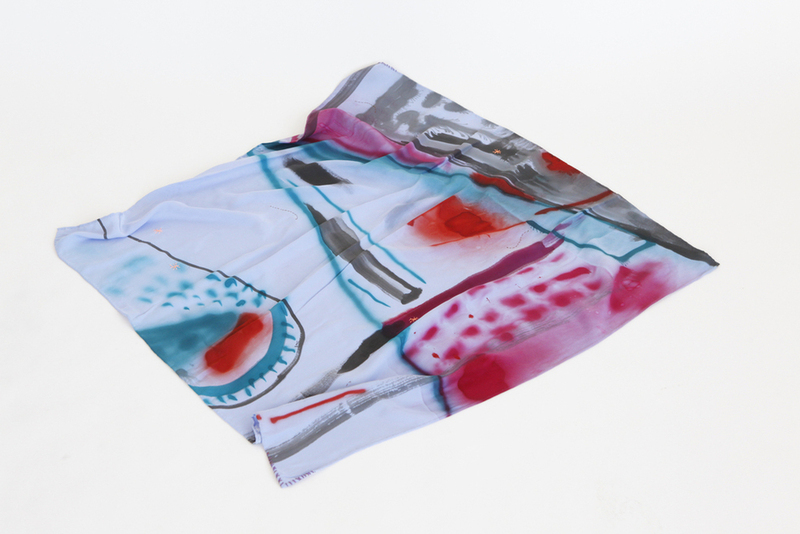 These hand painted and embroidered scarves by Naomi Clark on Grey Area are insanely gorgeous, wearable works of art! See all the designs here! I have a feeling that I held on to my childhood dolls longer than most young girls. I think I may have been almost thirteen before I finally stopped playing with them, although my favorites still held a place of honor in my room while I was young. Those were the symbols of childhood that I couldn’t bear to part with. I never wanted to forget the countless hours of play and joy those plastic babies had brought me. In her Doll series, Canadian artist Fausta Facciponte, confronts us with imagery of the forgotten dolls of our childhood, reminding us of the innocence we’ve left behind. When we’re young, many of our toys teach and shape who we may eventually become. Dolls seem especially important to teach children how to care and nurture. How many times have you “personified” a doll so that a child will know to be gentle with a baby? I can vividly recall a niece swinging a doll by her hair..
We dress and undress them, feed them plastic food, bathe them, swaddle and cuddle them. But as we mature, we reach a point where we realize that it is all pretend. That caring for a real baby is much more work, much more complicated. As we transition from childhood, perhaps we realize that the doll play mimics a much more scary reality. So we put away the childish toys, discarding them as infantile. But maybe what we are really putting out of our prepubescent minds is the inevitable reality of growing up and being faced with the actuality of the world we were playing and preparing for. To see more of Fausta Facciponte’s work, please visit her website. Are there any childhood toys that were touchtones for your transition from childhood to the adult world? Featured image is Peter by Fausta Facciponte, archival pigment print. Images are via Stephen Bulger Gallery.